Late in 2018, Keith Dotson was hired to provide four very large photographs to NCH Corporation HQ in the D/FW Metroplex. The site photos shown here were taken during the installation of the final framed prints mid-January 2019. All four of the black and white photographs were printed with archival pigments on 100% cotton fine art paper made by Hahnemühle, the great German paper company with roots back to 1584. Each print is 5 feet x 8 feet, which is the largest possible print size on fine art paper. "In the Shade of the Mighty Oaks," 2016, black and white photographs by Keith Dotson. This is normally one photograph. The designers wanted to frame it as a set of two. Photo courtesy of Thom Lasley, RSP. The project was designed on behalf of NCH Corporation by the talented people at the D/FW office of RSP Architects. They were nothing but a pleasure to work with! Many thanks to Thom Lasley of RSP Architects for the opportunity and for the site photographs. 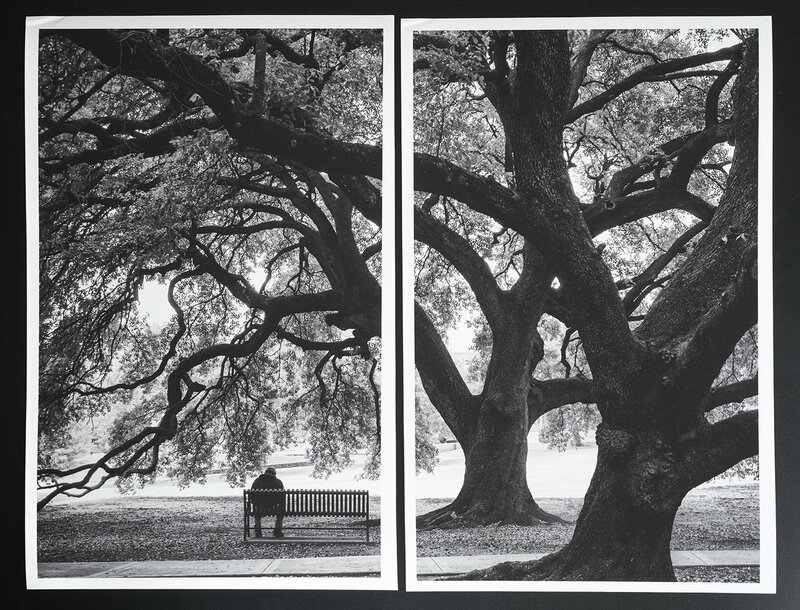 "Branches of a Mighty Oak," black and white photograph by Keith Dotson. Size: 96 inches x 60 inches. Photo courtesy of Thom Lasley, RSP. As part of this project, Keith approved two reduced-size proofs of the larger final prints. These will be available for sale on Etsy below, until they're sold. There's only one set at this special price. This is a set of two artist proofs that I received as part of the NCH project. The final prints are 8 feet tall by 5 feet wide, and I received these small 9.25 inch x 15 inch prints from the print vendor to check contrast and paper choice. Because of the unique circumstances, this is a one-time only offer at a special price.